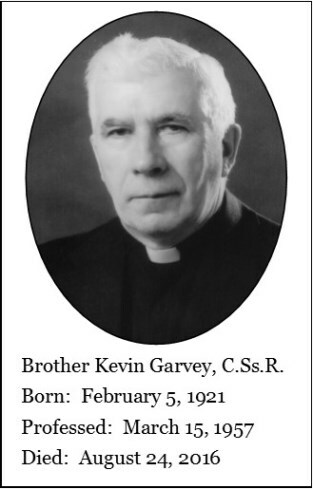 Brother Kevin (Matthew) Garvey was born on February 5, 1921 in Mayo (Buckingham), Quebec, a place he left an indelible mark upon by constructing a Shrine to Our Blessed Mother. He was from a large family; two of his three remaining sisters attended his funeral (Sr. Clarice Garvey, OLM of Toronto; and Claire Hawkes of Aylmer; Mary Burke in Kitchener was unable to attend) along with his one remaining brother, Regis, from Ottawa. Kevin died on August 24th at the Houses of Providence, his home for the past couple of years. Before he became a brother, Kevin worked wherever he could. He used to tell of his trips out West to help with the harvest, coming home on the train after months in the fields. He joined the Redemptorists in 1956, taking his first vows on March 15, 1957. Kevin was an excellent carpenter. He built chapels and renovated churches and community houses; he fashioned tables and chairs and many handy items used in everyday life (like the wooden peg he used to balance the ironing board when one plastic ‘shoe’ was lost). He was also the one to tear down the house at 418 St. Germain Ave. to allow for more parking and the beautiful lawn to the east of Madonna House. Kevin lived in, and plied his skills in, many Redemptorist communities: Redemptorist formation communities such as those in Woodstock, Brockville, Keswick, and HRC, Windsor. He was also stationed in Whitbourne, NL, St. John’s, NL, the provincial house, and St. Patrick’s Monastery, both in Toronto. Brother Kevin was a wonderful confrere, hard-working, self-motivated, prayerful even during his final months in Providence. He was a pleasant confrere to spend time conversing with who loved poetry and had a keen sense of his own and his family’s history. He left us at the age of 95 after a full life of service and prayer, a true Redemptorist Brother.